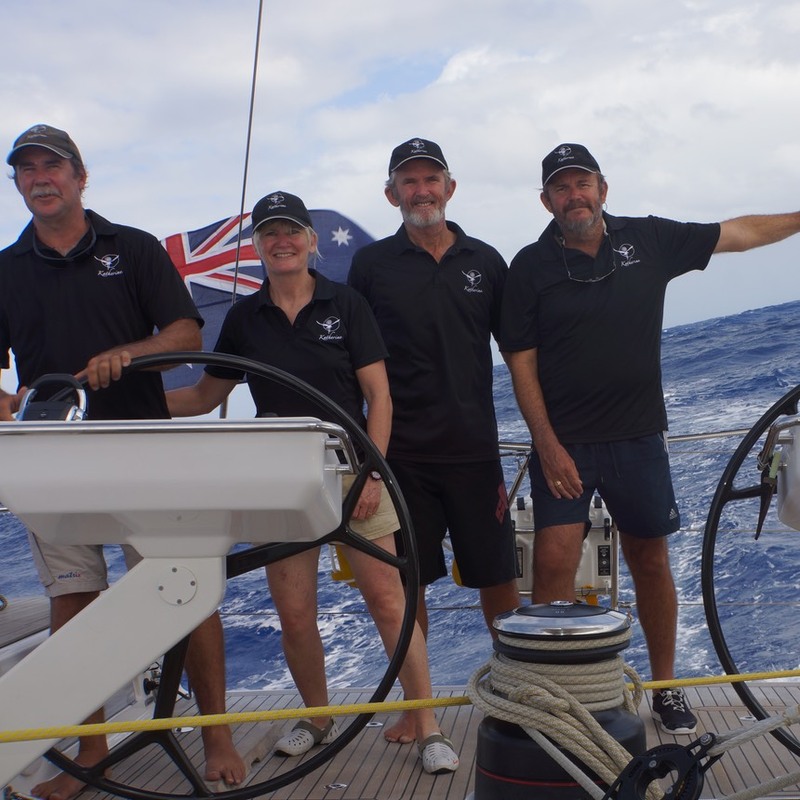 After 13 nights at sea and having sailed 2782 nautical miles we arrived into St Lucia in 13 days and 7 hrs approx at around 1pm on Monday nearly 12 hours earlier than we had earlier anticipated. In the last forty eight hours the conditions suited Katherine and she picked up her pace and we found ourselves consuming the miles. We hit 17knots+ boat speed twice in the last two days and that was with a reefed main. Our last day saw us pull in 265 miles so we were all happy that despite the set backs with sails we were able to show what Katherine was capable of. We had a maximum speed recorded of 19knots and straight-line VMG speed of 8.9knots with an average speed in the 9's. We finished fifth over the line from the group that started on the 27th. On entering the marina we were presented with a Rum Punch and a beautiful basket of fresh fruit. There are only a handful of the 260 boats in harbour yet our welcome was boisterous as horns sounded in acknowledgement that another yacht had made it safely in. We can see already that many of the other yachts suffered sail damage, most though only to their spinnakers. Joining the ARC to cross the Atlantic was definitely a good decision. Though we were not in contact via radio with any of the other boats we had some dialogue going with Berend on Islay and it was nice to know that there were other boats out here with you. When we first had trouble with our main the crew of Easyrider who had been alongside us in Las Palmas called to check that we did not need assistance as did the crew of Leeway. The camaraderie that the ARC created through the bringing together of such a diversity of people and boats all with the one aim of getting across the Atlantic safely is something we have never exposed ourselves to previously. We found the ARC staff to be enthusiastic and helpful, the coordination of events remarkable and the communication whilst on route for both weather and boat positions part of the highlight for morning discussions. We had already covered three thousand miles on Katherine before the start of the Arc in some challenging conditions in the Baltic. The crossing has taught us even more about our boat and has highlighted some issues that we will address to hopefully prevent breakages in the future. - That we lost full use of our main on Day 1 then had no main at all till Day 9. So whats next. Its going to take a couple of days to really clean the boat inside and out. Its amazing that with the 20 odd plus flying fish that decided to come onboard that no matter how quickly we sent them back to the sea their scales appear literally everywhere. We will stay in St Lucia till the ARC presentation night on Saturday 22nd then head south to start exploring the Carribean. We are looking forward to a few days of relaxation, uninterrupted sleep and the opportunity to welcome into harbour our neighbours from Las Palmas.